Story: The Sapphires follows four vivacious, young and talented Australian Aboriginal girls from a remote mission as they learn about love, friendship and war when their all girl group The Sapphires entertains the U.S. troops in Vietnam in 1968. 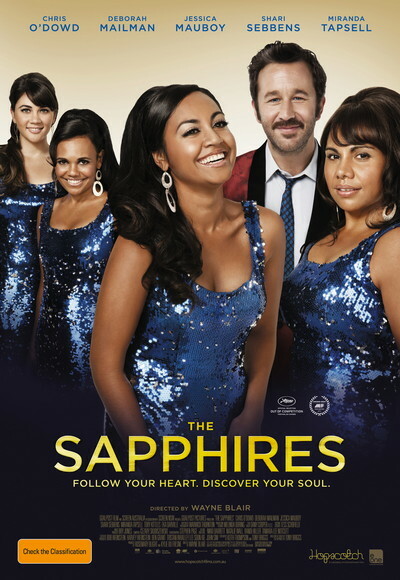 Cynthia (Miranda Tapsell), Gail (Deborah Mailman), Julie (Jessica Mauboy) and Kay (Shari Sebbens) are discovered by Dave (Chris O'Dowd), a good-humored talent scout with a kind heart, very little rhythm but a great knowledge of soul music. As their manager, Dave books the sisters their first true gig giving them their first taste of stardom, and travels them to Vietnam to sing for the American troops.